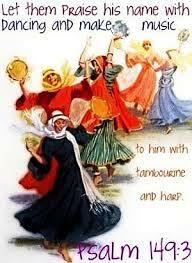 Davidic dance, sometimes referred to as Messianic dance, is a joyful expression of praise and thanksgiving to God. Davidic dance is sort of the "trademark" of Messianic Judaism. People from all walks of life are drawn into the joy of the Lord that we have in the messianic Jewish movement as expressed in David Dancing. Of course, to go with dance, we have uplifiting messianic music, and joyful praise. At TNJ we approach dance always with the beginner in mind. Advanced dance and team dancing, though used in special events, is not part of what we do during our Shabbat services. Our dance leader, Tara Stepakoff, (Rabbi's wife), has a wealth of over 20 years experience with Davidic Dance, but she makes it a point to keep it simple, so anyone can join in, and no one feels excluded. Whether a brand new beginner or an advanced dancer, everyone enjoys worshiping the Lord with Tara, in the slow, simple steps. The dance circle is open to all, but certainly not required of anyone. Once in a while, even the Rabbi will join in!